© Provided by AFP Addressing the United Nations General Assembly, Foreign Minister Sergei Lavrov said Western powers were resorting to "political blackmail, economic pressure and brute force" in order to "retain their self-proclaimed status as world leaders"
Russia's foreign minister on Friday accused the West of resorting to "political blackmail, economic pressure and brute force" to prevent the emergence of rival global powers. 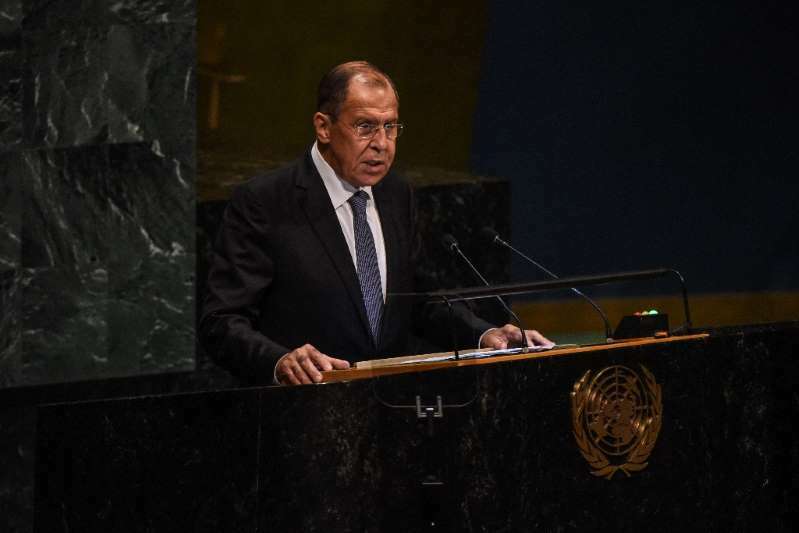 Addressing the United Nations General Assembly, Foreign Minister Sergei Lavrov said Western powers wanted to "retain their self-proclaimed status as world leaders." "These powers do not hesitate to use any methods including political blackmail, economic pressure and brute force," Lavrov told the assembly. At the podium earlier, Chinese Foreign Minister Wang Yi denounced "blackmail" in what was an apparent attack on President Donald Trump over trade and declared that Beijing would remain a "champion of multilateralism." Although he also did not mention Trump by name, there was little doubt about who Lavrov was referring when he denounced leaders who make "loud statements" that question the legal validity of international agreements and "declare the priority of self-serving unilateral approaches." He said that "attacks" were being launched against the Middle East peace process, the Iran nuclear deal, trade agreements under the World Trade Organization and the Paris climate accord. "We are observing an onslaught of belligerent revisionism against the modern system of international law," he said. Relations between Western powers and Russia have been tense over the war in Syria, where Moscow is supporting President Bashar al-Assad's forces. Lavrov said the international community and UN agencies must make the return of refugees to Syria "a priority" as Russia pushes for reconstruction aid for its ally. Russia and the United States are at odds over the Iran nuclear deal, although key US allies France and Britain have also vowed to defend the agreement that Trump ditched in May. Trump has also faced global outrage over the US decision to recognize Jerusalem as the capital of Israel, disregarding UN resolutions that declare the city's final status must be resolved through negotiations.